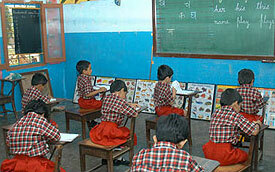 The School has classes from KG to Std.XII, with Science and Commerce at Senior Secondary level. The three languages taught to the students are: English, Hindi and Sanskrit. Other subjects taught are: Geography, History, Mathematics, Physics, Chemistry, Biology, C++ and Informatic Practice. Computer Education classes are conducted in well equipped and suitably furnished laboratories. Books and stationery are supplied by the school. A spacious Library with a large collection of books and magazines is also provided.